The Last Stand (you’ll ever need)? Recently I read something interesting in Stereophile, about real estate in some major cities being so limited (and pricey) now, that even rich folks are finding themselves with a lack of urban living space. While I’m not sure I buy into this rationale – especially when it’s being used to justify the latest $25,000+ monitors – it does seem, for one reason or another, that more audiophiles today are using really good, and expensive, stand-mounted speakers, than ever before. One only needs to look at the success of speaker makers like Harbeth in recent years, for proof of this trend. And these folks need stands to put these classy speakers on. And they need to be good stands. Enter the extraordinary Charisma Audio of Markham, Canada. Already a distributor and dealer of some fine product lines, and maker of a line of outstanding moving coil cartridges, Bernard Li now brings to market a unique, convertible speaker stand that borrows its’ name from the auto world – the Cabriolet. Meeting up with Bernard in Toronto, he pulled a slim, reasonably compact box out of his trunk and cautioned me that it was heavy, “about 60 lbs.” He wasn’t kidding! My years of experience lifting all kinds of audio gear suggests he might have forgot to say “..each”?? Wow. These things are extremely heavy. While at a casual first glance this stand may look similar to many others (albeit much more elegant), the design is indeed different from anything I’ve seen before. Firstly, it’s modular in both the vertical and horizontal planes. 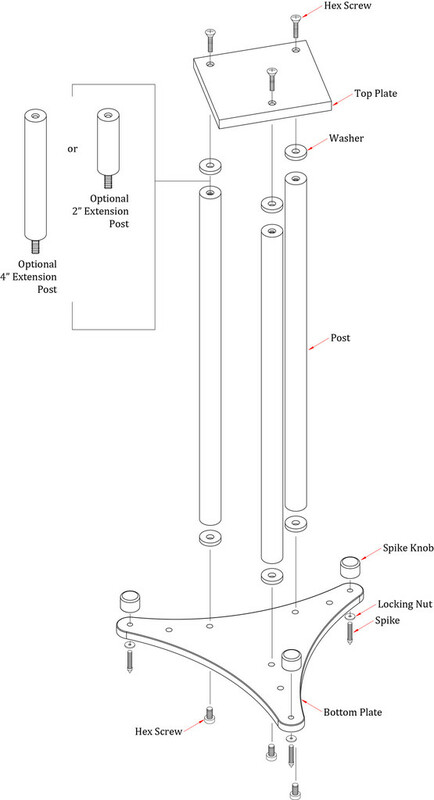 The extension posts can quickly transform the height, between 24, 26 and 28 inches. This makes it ideal for a music lover who owns (or reviews, borrows) various monitors that play optimally at different heights. 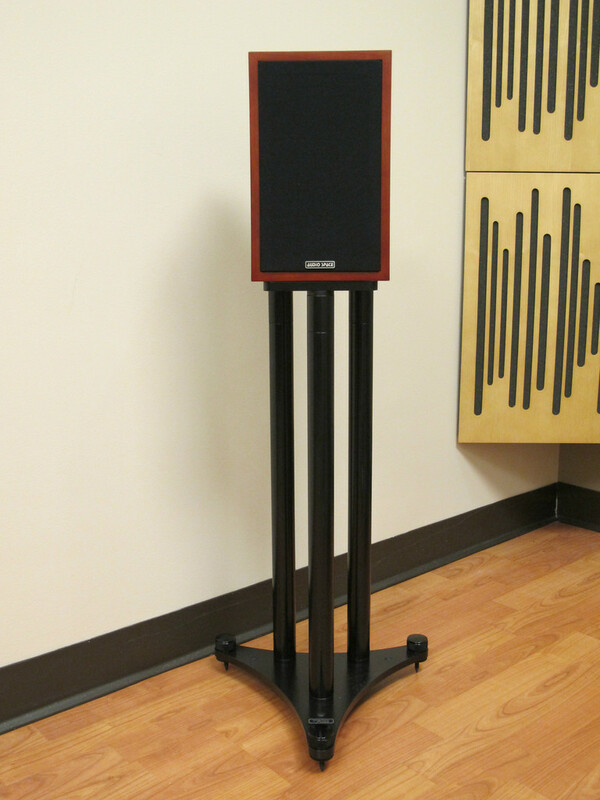 For example, my rosewood Quad 12L Classic would be used at the 24″ level in a music system, but as rears in a home theater, I could use them at 28″. 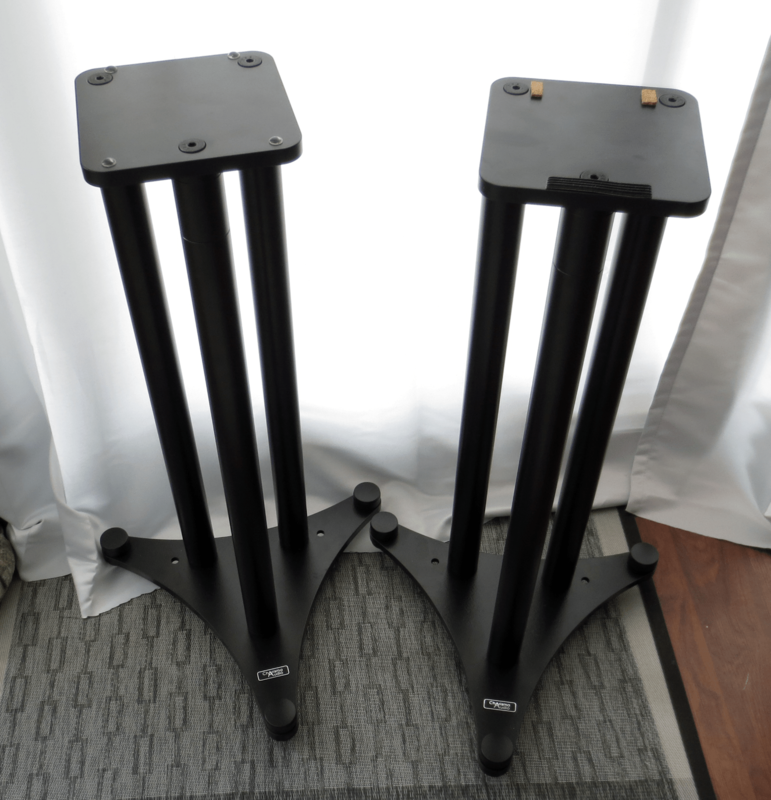 Brilliant – no need for any other speaker stands! If that weren’t enough, Bernard has machined the base plate with three additional holes, so that a user will be able to use this stand with a larger top plate in the future (to accomodate larger monitors). As such the Cabriolet will handle virtually all small and medium sized monitors. For the very largest monitors, e.g. 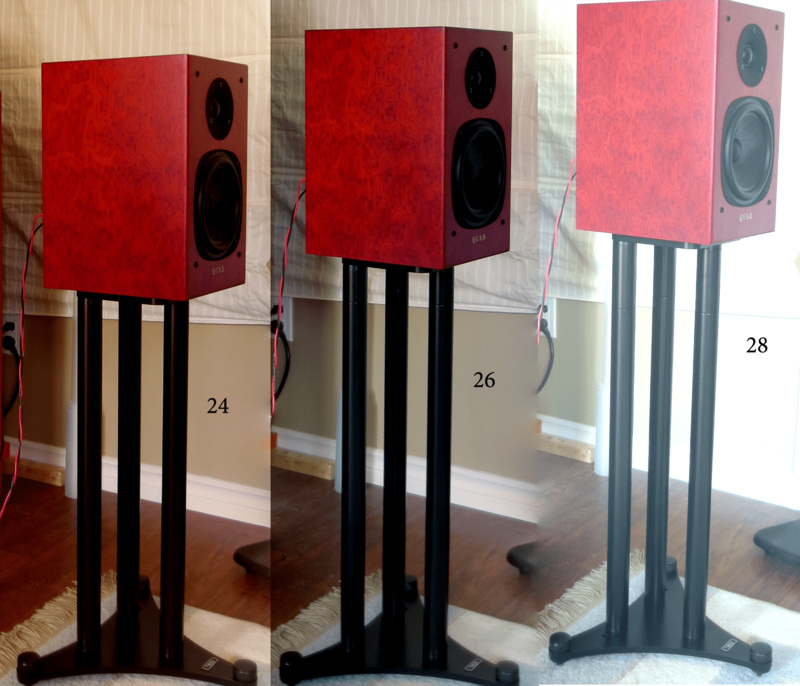 Harbeth or Spendor, or older Yamahas or JBL’s, which typically need a much lower stand height, Charisma is planning to introduce a different model, which will be physically wider and chunkier – to add stability but also to look proportionally correct for those large beasts. Other unique attributes? How about this, from Charisma’s website: “The three supporting posts as well as the extension posts are 1.5” diameter solid aluminum rods. The top plate is made of half-inch solid aluminum. The base plate is solid steel, for weight and rigidity.” Yes, you read that right. Solid aluminum and solid steel. Nothing here is hollow, or ‘fillable’. Speaking for myself, it’s the first time I’ve seen a speaker stand designed like this. Putting the stands together at home was quite straightforward. I followed the directions, but there really wasn’t much to it. I would suggest using gloves to avoid getting your hands dirty, as there was a bit of residual manufacturing stuff on the threaded steel inserts. Also, have an Allen key handy to loosen and tighten the hex screws – this made everything a snap. Charisma includes some small protectors as well as a package of Blu-tak, which can be used on the top platform to support your speakers more securely. So what’s the end result like? To say this is a proper 3-pillar support would be a big understatement. These stands are extremely rigid. They’re exceptionally well made, and very nicely styled. In use with my Quad monitors, I found that the upgrade in stands tightened up the focus in sound – like an audible reduction in distortion. While I wasn’t equipped to measure that, it makes perfect sense. Eliminating the ringing and resonance problems typical with flimsy metal stands should in turn help control unwanted speaker cabinet (and driver) resonances. 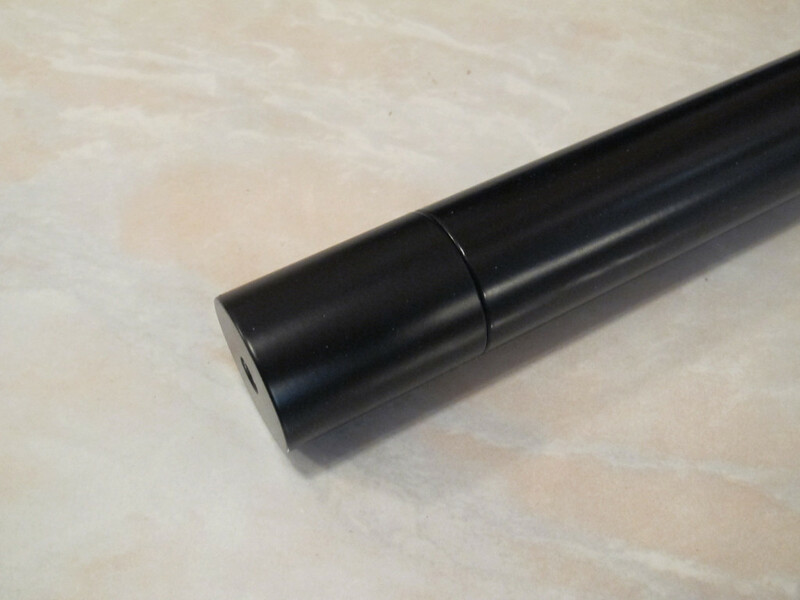 This leads directly to a cleaner, clearer sonic presentation. I heard/saw a notable improvement in image focus and overall soundstaging as a result. Bass and lower midrange frequencies also seemed tighter and more controlled. These things work! At US$1000 per pair, the Cabriolet stands aren’t cheap. When you see and feel them, you quickly realize why. Their flexibility and style adds hugely to the value equation. But hearing the end results is what made me a believer: this is simply a superior design. 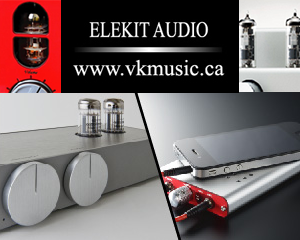 Made in Canada by one of our most innovative audio companies, the Cabriolet is a no-brainer recommendation. I’m pleased to present Charisma Audio with our Gold Star Award for the Cabriolet – for its exceptional performance, style, quality and value. A great product, enthusiastically recommended!